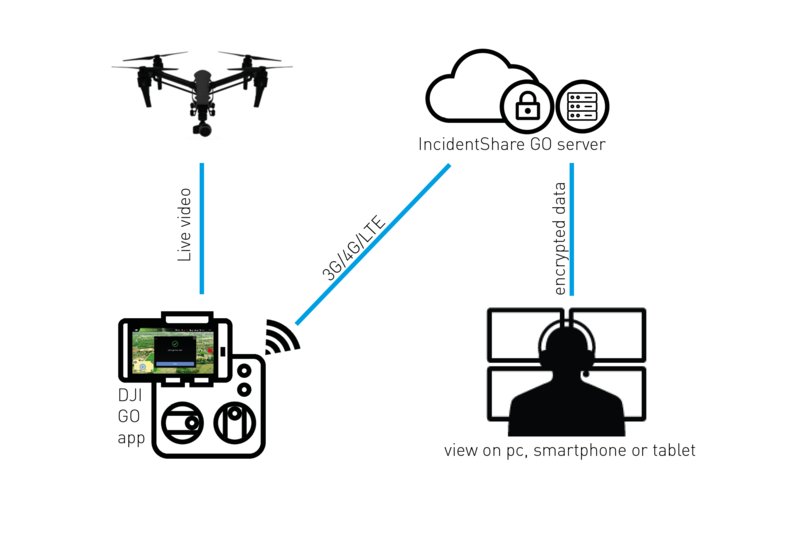 Incidentshare GO is a webbased software platform that makes you able to stream live video from DJI products, your smartphone (IOS and Android) or via RTMP. Whitelist 2 ip adresses if you like to add extra security, then the stream is only visible from these. Please note that during the checkout you need to choose billed monthly (default). The 100% discount will be applied at the end of the checkout process. For security purposes you need to enter a valid credit card. We will not charge you anything if you cancel the subscription during the first month. If you need to know details about the security please contact us with your questions or enquiries and we´l get back to you as soon as possible. Your broadcasts are recorded as a private video and it’s up to you whether you share it with your audience. We only store the latest recording created but you can easily download your latest recordings directly from within the IncidentShare GO site. With no caps on bitrate or resolution, your full HD content is passed through to the viewers. If you stream via the DJI GO app you're though limited by DJI to stream HD at 720p but you'll be surprised just how smooth that looks!